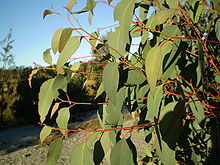 Eucalyptus olida, also known as the Strawberry Gum, is a medium-sized tree to 20 m, restricted to the Northern Tablelands of New South Wales. Flowers are cream coloured and are followed by small woody capsules. The glossy green leaves are intensely aromatic.